Euler famously used diagrams to illustrate syllogisms in his Lettres à une princesse d’Allemagne . His diagrams are usually seen as suffering from a fatal “ambiguity problem” : as soon as they involve intersecting circles, which are required for the representation of existential statements, it becomes unclear what exactly may be read off from them, and as Hammer & Shin conclusively showed, any set of reading conventions can lead to erroneous conclusions. I claim that Euler diagrams can, however, be used rigorously, if they are read in conjunction with the premises they are supposed to illustrate. More precisely, I give rigorous “heterogeneous” inference rules (in the sense of Barwise and Etchemendy) – rules whose premises are a sentence and a diagram and whose conclusion is a sentence – which allow to use them safely. 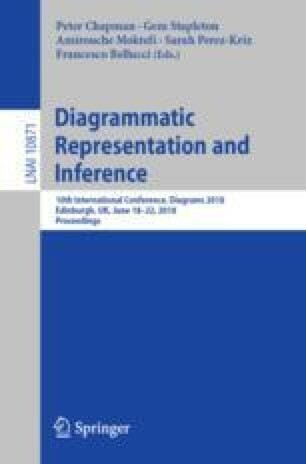 I conclude that one should abandon the preconception that diagrams can only be used rigorously if they can be given a context-independent semantics. Finally, I suggest that context-dependence is a widespread feature of diagrams: for instance, Mumma  noticed that what may be read off from a Euclidean diagram depends not only on the diagram’s appearance, but also on the way it was constructed. I would like to thank Jeremy Avigad, Ken Manders, Nicolas Michel, Marco Panza and David Rabouin for discussions on this topic.